You can now favourite opportunities. Just login or register, then "like" the opportunity, and we'll save it for you on your favourites pages. We'll even send you reminders when the opportunity deadline is approaching or the opportunities details are changed (unless you've asked us not to, of course). super/collider Presents: expedition: Ardrossan to Oban. Join super/collider and Sail Britain on a week long sea based residency, aboard the Alcuin, from Ardrossan to Oban via the Crinan Canal. VIDEOHOOK-UPS accepts pitches for articles concerning experimental film and video games. A collective for the unconventional in visual media, VIDEO HOOK-UPS seeks to motivate and inspire contemporary work through the exchange of art and ideas. Can you paint like the old masters or depict something that looks like the real thing? If so, apply to be a part of The Sinclair Gallerys brand new adventure and opening show! ORBIT is (for the timebeing) an online initiative, aiming to support and showcase the work of emerging artists and writers throughout the UK, with the initial aim of publishing reviews/articles and hosting residencies on a weekly basis. ORBIT hopes to act as a platform for discussion and collaboration between artists at all different stages of their career from all across the country. 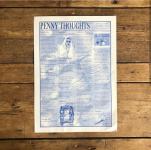 Penny Thoughts is a free newsletter publication that is distributed around Manchester and now further afield including an online presence. We print a new issue fortnightly and have published 17 issues so far and are looking for artists / writers / thinkers / procrastinators to submit to our upcoming issue! Walk the Plank and Manchester City Council are offering paid and unpaid placements to new artists looking to gain a better understanding and experience of working in outdoor arts. Placements will work with artists on Manchester Day between May and June 2019 in Manchester. This is an ELEVATE’19 artist development opportunity supported by Arts Council England. Are you organising an exhibition, fair or other creative opportunity? Need help with managing your submissions? CuratorSpace makes it easy to manage your opportunity, allowing you to review your submissions, make decisions, and communicate with your applicants all using our easy-to-use interface.